Helping the attendees, exhibitors, suppliers and other participants to locate the stalls/booths of their choice is an important aspect of trade show management. A convenient way of providing directions to the participants at a trade show is to display the directions on an electronic device. The iPad holders provided by Scribo Displays will help the participants at your trade shows to find information about their preferred stalls/booths easily. 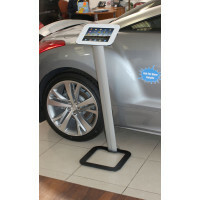 These iPad Holders can be rotated upto 360 degrees. They can be used with iPads from the 2nd, 3rd and 4th generations. These iPad holders comprise of satin aluminum poles tethered to steel bases. Their professional look is enhanced by concealing USB cables inside the poles. The orientation of these iPad holders can be switched easily from portrait to landscape and vice versa. The iPads can be locked into our iPad holders with two screws, while the white fascia ensuring a combination of style and safety. The covering provided for the 'Home' button on the iPad also reduces the scope for interference with the setting of the iPad. 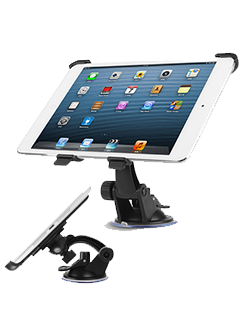 Take a look at our collection of iPad holders to locate those which are typically suited for your unique requirements.